5 years of Control anniversary party. The godfathers of ambient-house THE ORB interrupt their 25 years of activity celebrating tour and join the party. 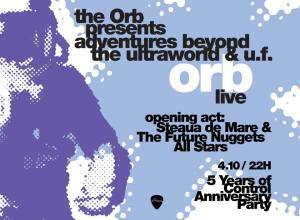 For the first time in Romania, THE ORB will play live at Control Club, Bucharest, their first albums – “Adventures Beyond the Ultraworld” and “U.F.Orb”. "5 years of Control #1 @ Control" Party in Bucharest. You can get here description, reviews, address, time and details of "5 years of Control #1 @ Control" Party in Bucharest. Visit Bucharest Tips for more Party events in Bucharest!